KAZAN, Russia — For Katie Ledecky, every single race on the big stage becomes an opportunity to make the superbly difficult look so easy. On Monday, in the preliminary rounds of the women’s 1500 freestyle, the 30-lap race that swimmers call the mile, Ledecky broke her own world record, touching in 15:27.71, 65-hundredths faster than she had gone last August at the Pan Pacific championships in Australia. That 15:27.71 also obliterated — by almost nine seconds — the former world championships (and then-world record) mark of 15:36.53, which Ledecky set on the way to winning gold in Barcelona in 2013. A 1500 world-record in the prelims! Afterward, Ledecky said it came easy. For the U.S. team, Ledecky’s performance offered a measure of salvation at a meet that is, just two days in, proving true the knowing predictions beforehand behind the scenes. Not one American swimmer earned so much as a medal Monday night. There were three finals Monday night in events that also get raced at an Olympics: the women's 200 individual medley, the men's 100 breaststroke and women's 100 butterfly. In the women's 200 IM, Katinka Hosszu of Hungary charged to a new world record, 2:06.12, three-hundredths of a second faster than the mark Ariana Kukors had set at the Rome 2009 championships. The two Americans in the race finished fourth (Maya Di Rado) and seventh (Melanie Margalis). The men's 100 breast and women's 100 fly finals? Those went off without any American qualifiers. None. Nada. Zip. In that 100 fly, Sweden's Sarah Sjostrom, for the second time in two days, set a world record. On Sunday, she went 55.74; Monday, 55.64. The men's 50 fly final (like the women's 1500 a non-Olympic event)? Again, no U.S. qualifier. The results Monday night came after the U.S. men’s 4x100 relay team finished 11th in Sunday’s prelims, a stunning turn — inexplicable, really — that left the Americans out of Sunday night’s final, won by France. Also Sunday, there were two U.S. swimmers in the men's 400 free final, Connor Jaeger and Michael McBroom. Neither made it to the top three. At the London 2012 Games, U.S. swimmers earned medals in that men's 400 free (Peter Vanderkaay), men's 100 breast (Brendan Hansen), women's 100 fly (Dana Vollmer) and women's 200 IM (Caitlin Leverenz). Not one of those swimmers -- for various reasons -- is in Kazan. To be clear, there are six more nights of racing in Kazan, and the U.S. is assuredly in line to take home medals. On Monday night, these U.S. swimmers moved on to Tuesday's finals: Matt Grevers in the 100 backstroke; Ryan Lochte, 200 free; Missy Franklin and Kathleen Baker, 100 back. At the same time, David Plummer, the Barcelona 2013 world championship silver medalist in the 100 back, did not qualify. Nor did Jessica Hardy in the 100 breast, a race in which in 2009 she set a then-world record; at Barcelona 2013, she took bronze in the event. Nor did Conor Dwyer in the 200 free; in Barcelona, he won silver in the race. It has been so long on the world and Olympic stage since the since the U.S. team came up empty-handed like it did in Monday's finals that experienced hands could not recall the last time it happened — evidence not only that the Americans need to step up their efforts aiming toward Rio 2016 but that the rest of the world has gotten a lot more capable. The U.S. team has been so good for so long that it seems almost heresy to acknowledge there might be vulnerability if not weakness. But, aiming toward Rio 2016, concern would appear to be justified. In prior years, the worlds the year before an Olympics has proven a solid gauge of U.S. swim performance at the forthcoming Games. For instance, in Shanghai in 2011, U.S. swimmers won 29 medals, 16 gold; in London in 2012, 31 and 16. 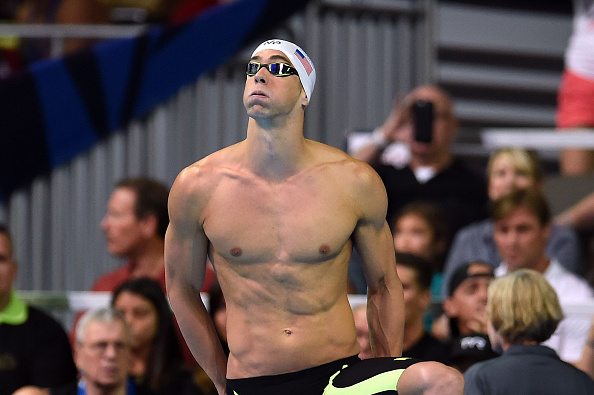 In the lead-up to Kazan 2015, however, it had become evident the U.S. team was not going to be at its best at these championships. For one, Michael Phelps is not here. For another, this team was picked a year ago, a strategy that may now deserve extensive review. By “not at its best,” let’s be clear — that’s relative to the high standards traditionally set by U.S. swimming. That would be tolerable, in a sense, if there weren't warning signs for a year from now. Going down the line: where are the results that would suggest bright U.S. prospects for medals in Rio in events such as the women’s 200 breaststroke and 100 butterfly? The men’s 100 breast? And more. The question ought to be posed now, with 12 months to go before Rio: what — if anything — is the plan? This needs to be asked, too, because it is just as much part of the package: what expectation is there for being part of a U.S. national team? Too, as the sport has grown, it’s evident that many American swimmers are keen to be considered eminently “professional” athletes. That's all well and good. But in the context of preparing for world and Olympic meets: what does that mean? Finances are one thing but this takes work, and a lot. Whose job is it to get them to produce when the time is right? Amid all this, there is Ledecky. Three years ago, at the London 2012 Games, she won the 800. Two years ago to the day, August 3, she broke the world record in the 800 at the Barcelona 2013 world championships. All in, before Monday, Ledecky had set seven world records — two in the 400, two in the 800, three in the 1500. On Sunday here, she won the 400 — just shy of world-record pace but in a new world championships time, 3:59.13. When she woke up Monday morning, looking out at her plan for the week, Ledecky could see the 1500, the 800 and, as well, the 200 free — with the complication that the 1500 final and the rounds of the 200 are about 20 minutes apart on Tuesday. And, probably, the 4x200 relay, too. Her coach, Bruce Gemmel, laid out the plan for the 1500 heat Monday morning: the first 900 meters easy, the next 300 building speed, the final 300 Ledecky’s choice — however she felt, fast or not. The idea was to take the race as something of a building block for the rest of the week. — Her first 400 meters: 4:06.41. Her last 400: 4:05.87. — That 4:06.41? That would have put her sixth in the 400 she won Sunday night. — At 800, she was at 8:15.29. That’s 1. second-best in the world in 2015, behind only the 8:11.21 that Ledecky herself put up, 2. in the top-10 all-time if had itself been an 800 free and 3. faster than Janet Evans ever swam in the 800. That would be the same Janet Evans who held the world record in the 800 for 19 years, from 1989 until 2008. — Ledecky's last lap? 29.47. That was her second-fastest lap of the race; she opened the first 50 with a 28.56. — Ledecky won the heat by 28.81 seconds over Jessica Ashwood of Australia. All Ashwood did in the race was lower her own Australian record, to 15:56.52 from 15:56.86, which she had put down at a grand prix meet in Townsville, Australia, on June 20. -- Swimvortex.com, an authority on the sport, pointed out that Ledecky's 15:27.71 is eight-hundredths of a second faster than the time in which Australia's Steven Holland set the world record to win the Commonwealth Games men's 1500 in 1975. -- Nick Zaccardi of NBCOlympics.com took to his Twitter feed to point out: Ledecky, age 18, 15.27.71. Lochte, age 19 in the 1500 at the 2004 U.S. Olympic Trials, 15:28.37. — American Katy Campbell finished eighth in the same heat Monday morning, in 16:39.98, three lanes over from Ledecky. That Katy Campbell is here belies the obvious: she is a world-class swimmer. There’s no way to say this delicately, so here goes: Katie Ledecky lapped Katy Campbell. Here is what is truly scary about Ledecky’s swim: she not only made it look easy, she said it was easy. “To be honest,” she said, “it did feel pretty easy. I wasn’t kicking much. I think breaking that record is just a testament to the work I have put in, the shape that I’m in right now that, you know, I was able to do that. “I’m in quite a bit of shock right now,” she said. Once more, she wasn’t kicking that much! “My pulling has improved a lot,” she said, which is swim talk for moving the body in the water with your arms. “You know, shout out to Andrew Gemmel,” a leading U.S. open-water swimmer who is also the son of her coach, Bruce. “He’s the fastest puller in the world. And I think, you know, having Bruce as a coach, you do a little bit more pulling. See what I could do just pulling! Only a world record. Asked when she knew she was on record pace, Ledecky said, “I realized kind of toward the end because I could see people, you know, waving. I could see where my parents and brother and uncle were sitting, and I could see them waving as well. It didn’t even like spur me on it all. Someone asked if, now that she had broken the world record, Ledecky planned to take it easier in Tuesday night’s final, concentrating on just winning the race. She also said, “In finals, there’s always a little bit more energy and excitement. I have never been somebody who swims slower at finals. So hopefully I can be right on that or a little better.